Prairieland Anglers Association helps its members enjoy fishing, promotes fishing in the community, and passes on fishing information by improving fish habitat, sharing of information, inviting guest speakers to meetings, and having fish outings. The PAA are also Friends of Dawson Lake and that means we strive to help the IDNR with projects at Dawson Lake. The PAA also joined the Friends of Reservoirs, which is a national effort to improve our water quality and fish habitat. 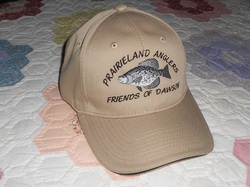 Make sure you get a new Prairieland Anglers hat! They are $20 and they will help raise some funds for our club.